NJ Gov. Christie & Obama Play Arcade Games In the Rain on Asbury Park‘s Boardwalk. Guess who won? All Smile now. There was lots of news today and I did not get to do a post on my beloved Governor and Obama’s 2nd visit to the Jersey Shore. Christie needs that return Photo-op for his reelection? Opps, I forgot, Christie is a Republican. But Christie helped Obama and invited him to the Jersey Shore after Hurricane Sandy devastation days before the Presidential Election of 2012. Nuff said, The Phillies are playing the Red Sox’s, top of the 9th inning Cliff Lee (5-2) on mound. ( I love lefties) 3-1 Phillies. (So sorry my Dear friend Tom, forgive me) Will my Philles find a way to Win in the Green Monster? Will Papelbon’s return to Boston close the deal if winning in 9th,? Or will Lee go the distance because he looks surgical tonight? Breath, it is long MLB season. Sorta like the next Presidential election of 2016. Well, not that long. They probably did. Christie and Obama really seem to know each other really well! BOSTON — Cliff Lee played the role of stopper again in leading the Phillies to a 3-1 win over the Boston Red Sox at Fenway Park on Tuesday night. Chrisie is a Rhino. He is a great disappointment to many and they all aren’t from NJ. He will never be elected to be the Rep. Presidental candidate. He didn’t have to cozy up to Obama.He would have gotten the same money either way. He is a wimp. 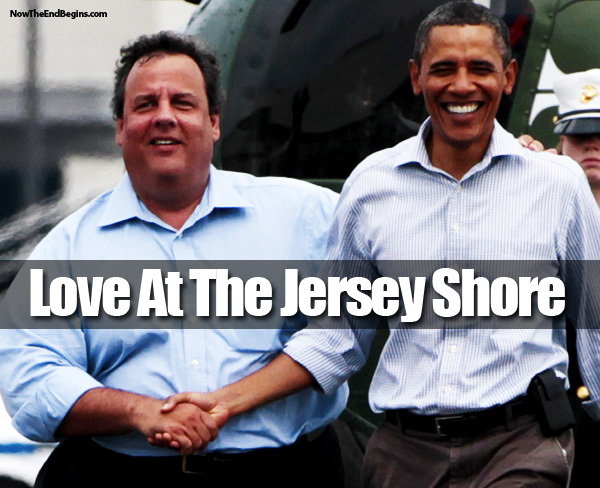 Muse, Christie and Obama’s love fest after Sandy. Did Obama cut him a check right then before the election, did the ppl affected get priority NO? Who knows what private dealings where going on behind closed doors. “Give me exposure,Christie.” Christie gave him that heartfelt Photo op. There are ppl that will never vote for this man again. I being one of them. This is Christie’s Dem opponent. I wouldn’t allow either one of them to touch me! All of Obama’s promises were not fulfilled. Now the people in NJ sees first hand that you can’t trust what any politician says. FEMA is just another govt. entity that doesn’t know what to do.